What’s your favorite thing to do on a rainy day? If I didn’t wear glasses, it’d be to take a long walk in the woods. So I’ll have to say I love to spend a rainy day curled up in a comfy chair with a good book! Lovelovelove listening to the rain on the roof. But not if it rains for a month at a time (as it did in June in Japan); anything gets monotonous if you hear/see/taste it over and over and over. I don’t want to bump into any old lovers. The only exceptions being, and this of course was entirely innocent, my ‘girlfriends’ when I was a pre-schooler and a kindergartner. When I was 3 and Eva was 4 we were neighbors and palled around until she moved from Iowa to Maryland and I moved from Iowa to New York, but then 17 years later, if you can believe it, we ended up at the same tiny Vermont college together (our names are both unique, so it was easy to reunite). But then she got married to a dipsh!t and had a baby and then divorced and….lost track of her. Sally was my pal when we were each 5. Her parents and mine are still friends, but we havn’t seen each other since we were 18, and then she married a dipsh!t and had 2 kids, made a million bucks then got divorced….. ANYWAY, wonder what’s in the fridge for lunch…..
btw, what does your dad say when you come home with new tats? I agree about the aisle window – but I do like to take pics from the window! Rainy days + comfy chairs + books + a blanket = soul food. I’m laughing so hard at #1. I think my grading scale has gotten tougher over the years. It rained for 3 weeks straight one year when I lived in Hawaii and I thought I was going to go crazy. That bridge shot is fantastic. I never think of dragging out my big ol’ camera. Maybe i should start. Someone with a real ‘lens’ on the world rather than my meagre digital snaps. Can all the former lovers show up naked? That would make updating report cards easier. Great shots! I love taking photos from the plane, so I usually choose window! 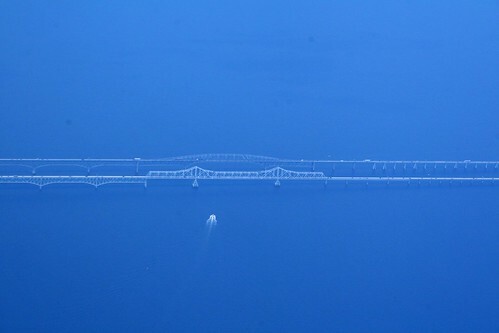 That is a beautiful photography of the bridge! How did you get it so clear? When I tried taking photos from the plane all the nose prints on the window smugged the photos. Love the pictures and love that you’ve had that dream before! I also really like the new tattoo! That is just too funny…especially on the middle finger! I like window seats because I sleep well on planes, and the window is nice to cuddle with. Hello! You’ve been tagged for ’six quirky things’. Go to my blog for the rules!! Have fun!! Oh, great pix BTW! 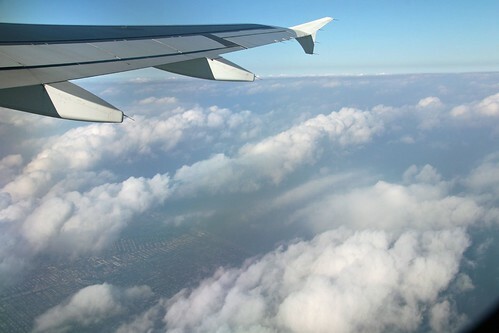 Oooo your high in the sky pics are lovely. Oh and your pass/fail answer made my partner laugh. Napping you forgot about napping in the rain…I love napping…but reading a good book, watching a good movie comes in a close second. Ideally, I really like the window seat for the take off and landing, and the aisle for everything in between, so basically, the whole row. I usually opt for the aisle, though, and then hope I’ll get a glimpse out of the window. Gorgeous shots!! re: the first question – in my case i’d wonder where they’d find a big enough banquet hall!